Craig and I finally brought my mom the rose bush we gave to her as a wedding party gift. 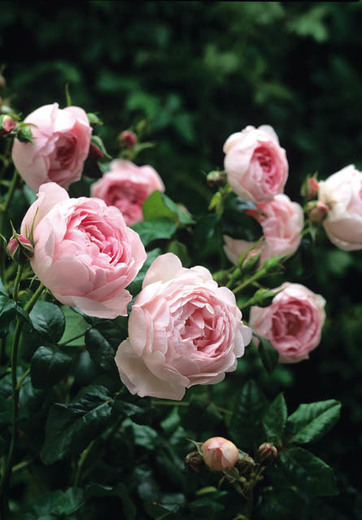 It was a David Austin English rose called Sceptered Isle. It was beginning to develop a home on our front porch and even started to grow two buds despite the fact it was still in its temporary pot. This is what it will look like when fully grown. I also bought her a bag of potting soil because she was running low. It would save her from having to deal with lugging the heavy bag by herself. While we were at her house, she gave us a tour of some of the things she’s been up to in the backyard. When I was a kid, she and my dad would spend long hours on the weekend and on their days off working out in the yard. It was just something they enjoyed doing. But now my mom is entering her 80s. She’s not as mobile as she once was and their backyard, which has now become a bit poorly maintained in some areas, is also quite dangerous for someone like her. She’s limited herself only to the patio because of this. All of her roses have been transplanted out of the ground and into pots for the patio. The containers make it easier for her to care for them. She showed me the different roses she was growing, one of which was a rose bush that bore lavender blooms. This is one I don’t think I’ve ever come across before. Unfortunately, it only bloomed once a season and that was it. She did manage to take a photo of it and showed it to me on her phone. We both talked excitedly about rose growing and I told her about the various endeavors I was undertaking. I told her we just planted the climbing rose that I ordered before the wedding and I showed her a picture of the blooms it’s supposed to produce. I told her our yard gets quite a lot of sunlight so I was eager to plant a rose garden. That was when she offered me one of her miniature roses to take home. I smiled. I felt like we finally had a mutual interest that we bonded over. I used to be adamant about being a city bachelorette and never wanting a yard to keep up because it would interfere with my nightly routine of going out. But here I am. Not only have I settled down and married the kindest, most devoted man, but I’ve also surrendered to my love for gardening as well. So things might not end up the way you expected, but just know it’s probably because that’s the way it was always supposed to be.